There are a variety of residential installation options available to achieve the ultimate comfort of radiant heat. TJ’s has years of experience with all applications. We are proud to install Viega products. We have a complete Viega Pro Radiant brochure available for download in our Resources section. 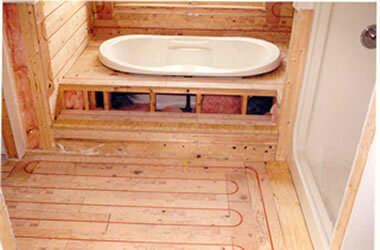 Viega Climate Panels are the easiest way to install a hydronic radiant floor heating system. Viega Climate Panels are made of aluminum-backed plywood with specially designed grooves for VeigaPEX Barrier tubing. The Climate Panel system is the most responsive radiant system for new or retrofit construction. The panels can be installed over wood subfloor or concrete and under any type of floor covering. Regardless of the floor covering, Viega’s Climate Panels provide more efficient heat and use less energy than traditional forced-air heating systems. Climate Panels installations are clean, lightweight and versatile. They only add 1/2″ to total floor height so there’s no need to adjust doors or moldings. The panels are constructed of 1/2″ CDX fir plywood and have an aluminum heat transfer sheet attached underneath which allows for even heat distribution, high-performance output and a reduction rate of up to 30% in energy consumption. Viega’s Climate Trak consists of heavy-gauge aluminum panels that can be stapled directly to the underside of the subflooring. These panels have a special trough for patented ViegaPEX Barrier tubing which maximizes the contact between the aluminum and the PEX tubing for efficient heat transfer. Climate Trak is perfect for retrofitting applications or for projects where build-up above the subfloor could be a concern. In-slab applications are perfect for basements, garages or workshops. ViegaPEX Barrier or FostaPEX tubing is installed under a lightweight concrete pour, turning cold, damp areas into cozy living spaces. 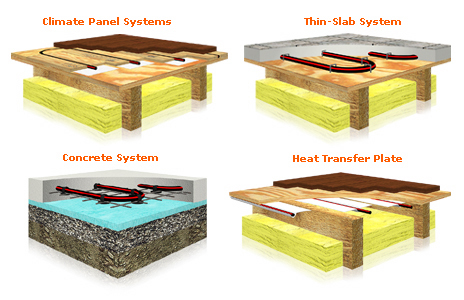 TJ’s uses Crete Heat insulation in their in-slab applications. In a snow-melting application, ViegaPEX Barrier tubing is installed in a concrete slab, with the proper controls, for the purpose of melting snow in driveways, walkways, patios and steps. TJ’s is proud of our multitude of completed radiant projects and repairs. We hope you will visit our Radiant Heat Project Photos page to see more.